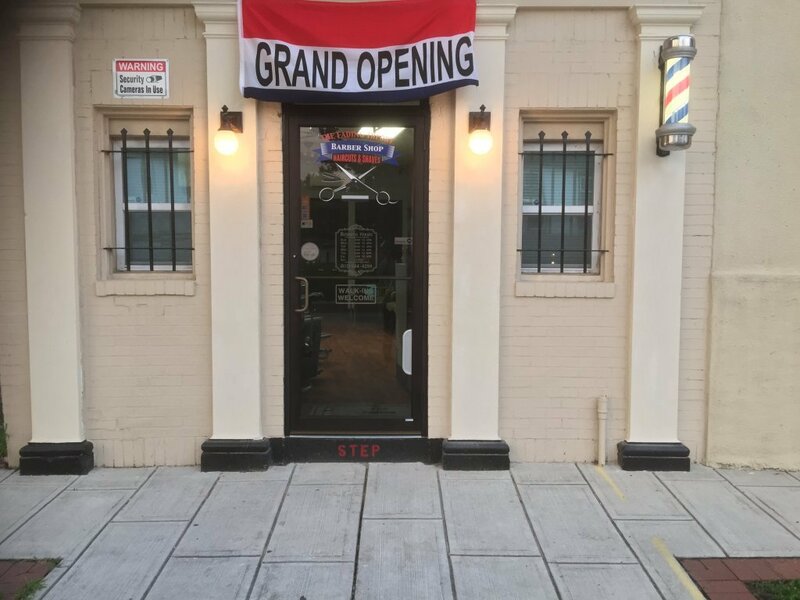 A: The Fading Theory Barber Shop LLC is located DIRECTLY on Harford Road at 4534 1/2 Harford Road, Baltimore, (Lauraville) Maryland 21214 next to the Harford-Belair Community Mental Heath Center Inc. and 1.5 blocks from Moravia Rd. We are between Moravia Rd and the fire station. If you have reached Safeway then you have went to far in that direction, and if you have reached McDonalds you have went to far in the other direction. We are not on ANY side streets. Take the #19, or #33 bus and get off at Harford road on the 4500 block. Our building is directly on Harford Road. Our building is pictured here, however we no longer have the grand opening sign up. Our building has columns, a barber poll on the front of the building, and a glass door. When we are closed there is a metal security gate covering our front door. A: The Fading Theory Barber Shop gladly accepts American Express, Master Card, Visa and Discover, however there may be fees associated with paying with a credit/debit card, or any other form of electronic payment. Q: Do you cut white hair and black hair? A: There is no such thing as “white hair, or black hair” There is however straight hair and curly hair. The Fading Theory Barber Shop cuts straight and curly hair. Q: Do you accept Apple Pay, or Samsung Pay? A: Yes, The Fading Theory Barber Shop accepts NFC (near-field communication) payments from Apple Pay and Samsung Pay, as well as others, however there may fees associated with using these options. Q: Do you have a mobile phone app? A: Yes, we are the first Barber Shop in Maryland to have its own dedicated mobile phone app. You may download our app free on our home page, or search The Fading Theory in your app store. Q: Do you know of any schools that I can contact for more information on learning how to become a barber? Q: Can you recommend any products for my hair? A: Sure we can! Here at The Fading Theory, we have our own line of hair-care products and would be glad to help you select one that works for you. Q: Do you take appointments as well as walk-ins? A: Here at The Fading Theory, we work predominately by appointments. Walk-in hair cuts are $30 each and shape ups are $20 each, no exceptions. A deposit is required for all appointments, via a valid credit card/debit card. We DO NOT rush services and we enjoy bonding with our clients, so sit back and relax while we take care of you. Q: I tried to make an appointment at 5:30pm, one day, but the online service would not let me. I thought you closed at 6pm? A: We close at 6pm Thursday, through Monday, and at noon on Tuesdays and Wednesdays, however once we have more appointments then we can finish by closing time, we stop accepting new appointments for the rest of that day. The online service will only show times, that are available. If you do not see a specific day/time, then that day/time is no longer available. Q: Are there any places nearby to grab a bite to eat or get a coffee? A: There are several places within a few minutes, walking distance to grab a bite to eat. There are snacks and drinks available for purchase in our shop, as well. Q: It is my child’s first hair cut. What can we expect? A: Here at The Fading Theory Barber Shop in Lauraville, we understand that first, or early hair cuts can sometimes be scary for the child, so we will not cut children’s hair, that are younger than 12 years old, unless they are just getting a regular (all even) hair cut, however they will not receive a shape up. We try to work through the child’s haircut experience as best we can, but their ability to remain calm and still during the process can sometimes prevent the service from proceeding. Fades, style cuts, etc. will NOT be done on children under 12 years old. Toddlers will NOT receive hair cuts. A: The Fading Theory Barber Shop in Lauraville, has gift cards ranging from $15 to $100. Q: How can I be sure that the place and person I currently use is licensed, legit and legally permitted to work on me, or my loved ones? Q: What are some things that I should look out for as a customer when entering a barber shop? You know, things that should be RED-FLAGS to me and my loved ones? Any signs of illegal drug activity in the facility that is not being addressed. Lack of valid barber licenses with the barbers picture attached to them at each work station. Lack of a valid store license posted in the shop. Foul and inappropriate behavior, language, or activities that is not being addressed by staff. Unprofessional staff, employees, or contractors. Upon entering the facility there is no greeting from staff. Any use of disparaging terms, such as the “N” word, or using the “B” word to describe people, or women. An unsanitary facility, that shows no thought of maintaining a high level of cleanliness. Any pets living in, or roaming the barber shop. Any signs of a person living in the barber shop. The barber not cleaning their clippers, work area, hands and floor after EACH cut. Sweeping hair in a corner for later clean up is not permitted! Q: Which social media accounts do you have? A: The Fading Theory Barber Shops ONLY social media accounts are listed here. Click any media badge at the bottom of any page to be taken there. We also have ONLY 1 web site and you are on it. Q: I know how to cut hair, but I do not have a license. Can I cut hair in your shop?